Patients are driving video telehealth and the increase in patient experience it provides. The patient experience should no longer be compared to one provider over another it’s being compared to consumer experiences. Consumers demand “right now” and convenience is at an all-time high. The patient experience is being compared to the Amazon experience of “everything at your fingertips instantly”. Healthcare providers are scrambling to implement as the new video telehealth billable codes continue to increase on January 1, 2019. While healthcare professionals are focusing on the increase in revenue on those video telehealth billable codes today and what is coming in the future. The patient experience and operational efficiencies are usually an afterthought. Patients are selecting their doctors, hospitals, and providers based on convenience. Millennials and Gen Z’s (the largest growing demographic in healthcare) are not loyal to any provider. The video telehealth industry is positioned to explode by 2018 with an anticipated 7 million patient users, up from 350,000 patients in 2013, according to an IHS Technology report. Millennials prefer retail clinics and urgent care (making up a 44% of clinic patients, twice the number of baby boomers) to going to see their primary care physician. This under 37 years old demographic prefers video telehealth as they have no established relationships with a PCP. Which video telehealth billable codes apply to your practice, how do you bill, track and prepare for what you can bill for today and what you can bill for January 1, 2019? Which video telehealth technology do you select, when do you implement it and how to get your staff ready? And if you are an innovative healthcare professional, you are thinking beyond 1 and 2. First of all, in order to grow you must also think about patient experience and convenience. In conclusion, while you should be in implementation mode for video telehealth already as there are many benefits without waiting on billable codes in your state. You should be started with #3 above and some of these items, while you are waiting on your video telehealth billable codes to increase that portion of the revenue. The ability to provide a higher level of patient experience using virtual video telehealth experience. This instant and innovative technology are what Millennials and Gen Z’s are making their primary decisions on. The patients are driving video telehealth! Operational efficiencies gained through video telehealth can save you millions. Your healthcare practice can see more patients, faster and with less staff with video telehealth. Using this for aftercare follow up, pre and post surgeries, after hours and many more use cases not only saves you money, it increases the level of patient satisfaction. You are losing money and patients today to retail clinics popping up on every corner. In addition, consumers are also using mobile apps where you can connect with a doctor in seconds. What is your marketing strategy for growing and not losing patients? 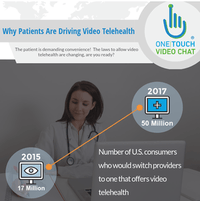 Click here to download our video telehealth infographic.